Today I have a new polish, new stamping plate, and some lovely water decals to show you. The polish and stamping plate were given to me by Michelle from Break Rules Not Nails for being a loyal follower on her blog – I highly encourage you to go take a look at her blog, she does amazing nail art and finds plenty of ways to stick weird and wonderful things to her nails. This is Chi Chi Sophisticated Sassy. I really think it’s the perfect name for this polish. The base is a very sophisticated deep, dark red, but it’s filled with plenty of sassy sparkle! The formula was good, it was a little patchy on the first coat but evened out on the second – I added a third just to make sure it looked perfect for pictures but 2 would probably be fine. I am just in love with this polish! It is so beautiful! Next I added the stamping and decals. On my thumb, I stamped using Tip Top Gold Mine and MM20. This is my first Messy Mansion plate and I just love it. It’s bigger than the other circular plates I have, making it easy to stamp for the thumbnail as well, and the quality is great – not to mention I love the images! I’ll definitely be added more Messy Mansion plates to my collection in the future. The water decals are from the Born Pretty Store and were provided to me for review. 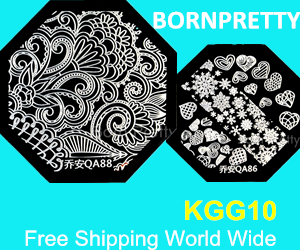 In case you haven’t heard of it, the Born Pretty Store is an online store which stocks a huge variety of nail art items, from decals to studs to stamping plates, as well as nail polishes and fashion items. These water decals were easy to apply following the instructions on the pack. They don’t stick very well on their own but once a top coat has been applied over them, they’re not going anywhere. The instructions do say you need to top coat so that’s not a problem – I’d always apply one anyway. The only small issue I had was that the decals didn’t lie 100% flat before adding the top coat, and when I did add it a small amount seemed to go under the parts which didn’t lie flat and damage the decal. You can see this on the lettering on my ring finger. However, I thought this was a very minor problem, I still loved the way my nails looked and I don’t think anyone would notice that! The rose pattern is absolutely beautiful and I think it looked amazing over Sophisticated Sassy. These decals are available here. Thank you! Yes isn’t it just a stunning polish? I couldn’t stop staring at my nails!